Last week I received a letter from a fellow-Dutchman who lives in a remote region of the Netherlands. He wrote me that he had found a strange object in a local thrift shop. Attracted by its shape, weight and material, he had bought it – presumably for an insignificant amount since articles in thrift shops never cost much. It’s a solid brass ring, open on one side, with four knobs. It weighs almost 10 lbs (4.2 kg! ), and measures 6″ wide without knobs, and 9½” including knobs – i.e. 15 cm resp 24 cm – and 2″ high (5 cm). After coming home with his mysterious object, he started to Google and stumbled on my name, website and blog where I had described these rings. He had bought a nitien, a Kru (or Grebo) ring from Liberia! I was flabbergasted. It is the second time in nearly ten years that someone in the Netherlands contacts me after buying a Kru ring. The first time was in 2010 when a friend-of-a-friend, Fred J., told me that he had bought a Kru ring – also not knowing what he bought – in a garage sale, in the southern province of Brabant, in the Netherlands, near the Belgium border. See photo left. Arnoldus G., the compatriot mentioned above who had bought the ring at a local thrift shop, lives in the north of the Netherlands, in the province of Groningen, not far from the border with Germany. He had bought the nitien at a thrift shop in the nearby town of Winschoten. Yesterday I drove to the province of Groningen and met with Arnoldus, who was so kind to show me his find. It’s a very complete, good looking ring, with hardly any damage or wear and tear. The ring is in a very good condition. Of course, the very first question that arises is: ‘Is it a real nitien or is it fake?’ People in Liberia call these objects ‘nitien’, ‘tien’ or ‘Dwin’ meaning water spirits or ‘Gods of water’. Below I wil try to answer these questions. Question 1: Real or fake? The question ‘real or fake’ focuses on the authenticity or authentic origin of the ring. In previous postings I’ve already dealt with the mystery surrounding these rings: What was their original use, for which purpose have these objects been made, and how old are they? Interested readers are kindly referred to these postings. I concluded, in conformity with the conclusions of Scott Sheppard, a major expert on ‘nitien’, that we are dealing here with ritual objects, village or clan fetishes. It is very, very unlikely that these rings have been used as money. Imagine, some of these rings can weigh as much as 20 pounds! 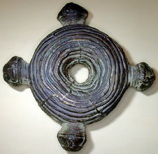 Kru rings – or Grebo rings as they are sometimes called – differ in shape, weight and material used. I’ve seen solid brass ones, others had a sand core. An explanation of the latter could be that the maker was short of brass whereas sand was widely available and cheap. But maybe solid brass rings were more prestigious. After all, we’re talking about village or clan fetishes. Solid brass rings may have been – still are??!!! – more powerful! Similarly, open versus closed rings: no explanation – not even a theory – exists as to the reason of this difference. Compared to other ‘nitien’ I’ve examined, I am inclined to conclude that the ring found in the thrift shop in Winschoten is an old, original one. However, there exists only one scientifically acceptable method to determine with absolute certainty the age of these objects: a radio carbon testing. 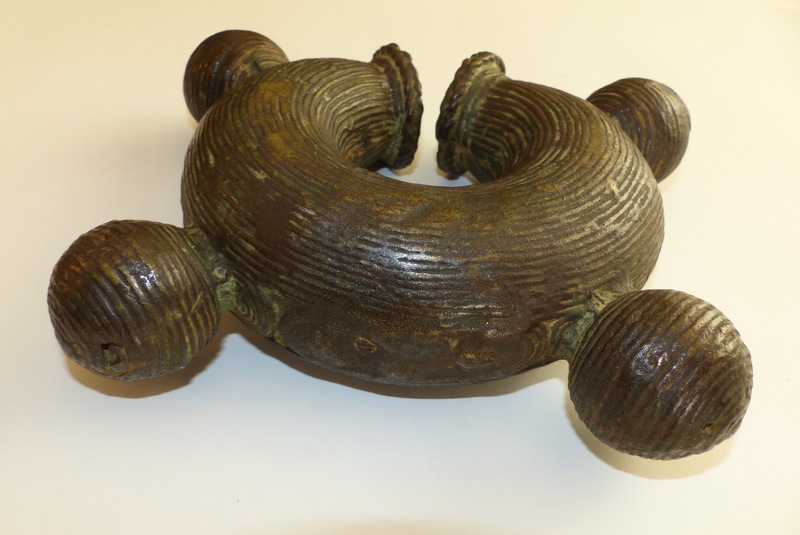 Question 2: Who was the previous owner of this open-ended ring with four knobs and how did it emerge in Winschoten? Most objects in garage sales or in thrift shops are redundant goods. From time to time people tidy up their garages, attics, cellars, cupboards, and decide to get rid of old stuff. Another major source of supply for thrift shops are the unwanted household effects of a deceased person. Together with Arnoldus G. I went to the Winschoten thrift shop and asked the person who had sold the ‘nitien’ if he remembered where it came from. He stared at me, and in his eyes I could see confusion and the big question why I was interested in this strange object? 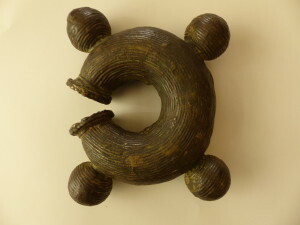 I told him that I am doing research as to the geographical origin and original use of these objects, ‘from Africa’. I explained that if I would know the (name of the) owner, I could ask his next of kin for more information. In general, people working in a thrift shop do not remember where they pick up old, discarded household goods. Initially, my man told me that too: the driver of the truck picking up goods usually visits several addresses a day, so in general he does not recollect what comes from where. However, after a few seconds, he told me that the previous owner of the ring had passed away and that they had picked up ‘a whole lot of African stuff ‘in his house. Arnoldus G. who had increasingly become interested in the strange object he had bought, provided me with an additional, plausible explanation how this ring may have ended up in Winschoten. This region used to be well-known for its shipyards and shipping companies. He suggested that the previous owner might have worked on a ship and may have bought souvenirs in ports or places he visited. Given the strong historical relations between ‘Holland’ (the Netherlands) and Liberia (‘the Grain Coast’) this sounds reasonable, but this hypothesis still has to be confirmed by facts. Further, the next question is: when did this person buy this? Assuming that the deceased was in his eighties when he died, does it make sense to estimate that he may have bought it between 1950 and 1985? A wide range, some 35 years. I will first await more information concerning the previous owner before advancing more speculations. Last but not least, a final question needs to be asked, but I’m afraid we’ll never know the answer. Where in Liberia does this ‘nitien’ come from? Generally speaking, these objects originate from the eastern part of Liberia. However, since it was taken out of its natural, cultural and geographical environment, we may never know the exact place of origin of this ‘nitien’: which clan, which village, which creek or river? Unfortunately, this is the case with most of the ‘nitien’ now in possession of foreigners or foreign musea, in the US, in Germany – recently eight ‘nitien’ were sold there at an auction -, the Netherlands or another European country. I’ve pleaded on previous occasions for more research on the history of these ‘nitien’, or Kru (Grebo) rings because ‘If you don’t know where you’re coming from, you don’t know where you’re going to.’ I sincerely hope that one day this wish comes true. This entry was posted in 'Dwin', 'Holland', 'tien', Arnoldus G., Brabant province, Culture, Europe, Fred J, garage sale, Germany, Gods of water, Grain Coast, Grebo, Grebo rings, Groningen province, Kru, Kru rings, Liberia, Liberian History, nitien, research, Scott Sheppard, shipyard, the Netherlands, thrift shop, US, water spirits, Winschoten. Bookmark the permalink.